Christopher Thomas Ault (born November 8, 1946) is a former American football player, coach and athletic director. He served three stints at the head football coach at the University of Nevada, Reno (1976–1992, 1994–1995, and 2004–2012), leading the Nevada Wolf Pack to a record of 234–108–1 over 28 seasons and guiding the program from the NCAA's Division II to Division I-AA in 1978 and then to Division I-A in 1992. Ault was also the athletic director at Nevada from 1986 to 2004. He was the school's starting quarterback from 1965 to 1968. He is a former consultant for the Kansas City Chiefs of the National Football League (NFL). Ault was inducted into the College Football Hall of Fame as a coach in 2002, seven years after his first retirement from coaching in 1995. The Nevada Wolf Pack football program represents the University of Nevada, Reno in college football. The Wolf Pack competes in the Mountain West Conference at the Football Bowl Subdivision level of the NCAA Division I.
Christopher Joseph Tormey is an American football coach, currently the linebackers coach for the BC Lions of the Canadian Football League. Ault is credited as the creator of the "Pistol Offense", which he instituted at Nevada in 2004. Since becoming the primary offense for Nevada, the Pistol has been used by other schools across the country. 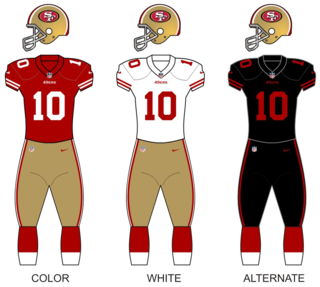 The San Francisco 49ers began employing the pistol offense with the emergence of former Nevada quarterback Colin Kaepernick. Since installing the Pistol, Nevada has won shares of two WAC titles—in 2005 (with Boise State) and 2010 (with Boise State and Hawaii). The pistol offense is an American football formation and strategy developed by Michael Taylor and popularized by Chris Ault in 2005, while the latter was head coach at the University of Nevada, Reno. It is a hybrid of the traditional shotgun and single back offenses. In the pistol offense, also commonly referred to as the "pistol formation", the quarterback lines up four yards behind the center, which is much closer than the seven-yard setback in a traditional shotgun formation. The running back then lines up three yards directly behind the quarterback, which is in contrast to the shotgun, where they are beside each other. It is argued that the position of the quarterback in the pistol formation strikes an advantageous compromise: the quarterback is close enough to the line of scrimmage to be able to read the defense, as with run situation sets such as the I formation, but far enough back to give him extra time and a better vision of the field for passing plays, as in the shotgun. The pistol formation is thus very versatile, particularly if the quarterback himself is a threat to run the ball, which makes it difficult for the defense to correctly anticipate the play. This flexibility is enhanced by the Read Option, where the quarterback reacts to the response of the defensive players to the snap, and makes a rapid decision whether to hand off the ball to the running back, keep it and complete a pass to a downfield receiver, or keep it and run himself. Colin Rand Kaepernick is an American football quarterback who last played for the San Francisco 49ers in the National Football League (NFL) in 2016. Ault won his 200th college football game October 9, 2009 when his Wolf Pack beat Louisiana Tech, 37–14. In US football, the 2009 Nevada Wolf Pack football team represented the University of Nevada, Reno in the 2009 NCAA Division I FBS football season. The Wolf Pack were led by head coach Chris Ault. The Wolf Pack played their home games at Mackay Stadium. The Wolf Pack finished the regular season 8–4 and 7–1 in the WAC, good enough for second place in the conference behind Boise State. They were defeated by SMU in the Hawaii Bowl. The 2009 Louisiana Tech Bulldogs football team represented Louisiana Tech University in the 2009 NCAA Division I FBS football season. Louisiana Tech Tech competed in the Western Athletic Conference (WAC) and played their home games at Joe Aillet Stadium in Ruston, Louisiana. The team was coached by Derek Dooley, who was in his third year with the program. The Bulldogs finished the season 4–8 and 3–5 in WAC play. On December 28, 2012, Ault announced his retirement, effective at the end of the year. In an emotional press conference, Ault said the time had come to pass the program to a new coach. He had spent 41 years―all but seven years of his adult life―at Nevada as a player, coach or administrator. On September 17, 2015, Rhinos Milano announced Ault as new head coach for the 2016 season. On July 9, 2016, he won his first Italian Football League Italian Bowl after an undefeated season and a 13 games win streak. The Rhinos Milano are an American football team based in Milano, Italy. The team was founded in 1976 and won the Italian Superbowl in 1981, 1982, 1983, 1990 and 2016. 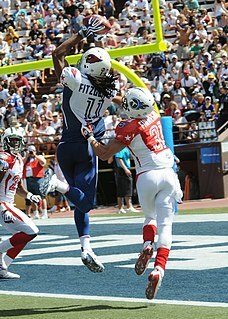 Italian Football League (IFL) is an American football league in Italy. Ault graduated from St. Catherine's Academy in Anaheim, California, graduated from University of Nevada, Reno with a bachelor's degree in education in 1968 and went on to complete an M.B.A. in 1971. He is married to Kathy Ault and has three children: Lisa, Chris Jr. and Amy. The Fremont Cannon is the trophy awarded to the winner of the Battle for Nevada, an American college football rivalry game played annually by the Nevada Wolf Pack football team of the University of Nevada, Reno (Nevada) and the UNLV Rebels football team of the University of Nevada, Las Vegas (UNLV). The trophy was built in 1970 and is a replica of a 19th-century Howitzer cannon that accompanied American explorer and politician John C. Frémont on an expedition to the American West and Nevada in the mid 19th century. The original cannon had been abandoned, due to heavy snows, in the Sierra Nevada in 1843. The replica cannon was originally fired following a touchdown by the team in possession of the cannon, it has been inoperable since 1999. The wooden carriage is painted the school color of the team in possession, navy blue for Nevada or scarlet for UNLV. The trophy is the heaviest and most expensive in college football. Since 2012, the game is also part of the Governor's Series, the series of athletic competitions between the two schools. Robert Patrick Petrino is an American football coach and former player. He most recently served as the head coach of the Louisville Cardinals football team from 2014 until being fired during the 2018 season. From 2008 to 2011, Petrino was the head football coach at the University of Arkansas. He was dismissed from that position in the spring of 2012 "with cause". Petrino also coached the Atlanta Falcons of the National Football League (NFL) for the first 13 games of the 2007 season. He spent the 2013 season as head football coach of the Western Kentucky Hilltoppers. 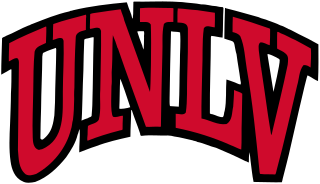 The UNLV Rebels football program is a college football team that represents the University of Nevada, Las Vegas (UNLV). The team is currently a member of the Mountain West Conference, which is a Division I Bowl Subdivision conference of the National Collegiate Athletics Association (NCAA). The program which began on September 14, 1968, is coached by former Bishop Gorman High School head coach, Tony Sanchez. The team's home games are played at Sam Boyd Stadium in Whitney, Nevada. Michael Charles Sanford is an American college football coach and former player. He served as the head football coach at University of Nevada, Las Vegas (UNLV) from 2005 to 2009 and at Indiana State University from 2013 to 2016. He is a graduate of the University of Southern California (USC), where he played quarterback for the Trojans from 1973 through 1976. Jeffrey Michael Tisdel is a former American college football coach. He was the head coach at Sierra College, a junior college in Rocklin, California from 2000 to 2005 and from 2007 to 2012. Noteworthy accomplishments include coaching the Nevada Wolf Pack in its first Division I-A bowl victory in the 1996 Las Vegas Bowl against Ball State and, between 2002–05, leading Sierra College to a nation-leading 37-game winning streak. Tisdel was also the first quarterback for Nevada to play in Division I-AA, moving up from Division II in 1978 and the first quarterback to play for Chris Ault, who became a member of the College Football Hall of Fame in 2002. After taking the 2006 season off, Tisdel returned to coaching his Sierra College team which ended the 2007 season ranked fifth in the nation by JCGridiron.com. Jeffrey Scott Horton is an American football coach. He currently is the offensive coordinator and running backs coach at San Diego State University. He was the interim head coach at the University of Minnesota, having replaced Tim Brewster, who was fired midway through the Golden Gophers' 2010 season. Horton previously served as the head coach at the University of Nevada, Reno in 1993 and at the University of Nevada, Las Vegas from 1994 to 1998. From 2006 to 2008, he a special assistant/offense and assistant offensive line coach for the St. Louis Rams of the National Football League (NFL), where he worked under head coach Scott Linehan. Horton coached the quarterbacks for the NFL's Detroit Lions in 2009. The 2008 Humanitarian Bowl was a postseason college football bowl game between the Maryland Terrapins and the Nevada Wolf Pack on December 30, 2008. It was the two teams' first meeting. The game featured two conference tie-ins: the University of Maryland represented the Atlantic Coast Conference (ACC) and the University of Nevada represented the Western Athletic Conference (WAC). The game was played at Bronco Stadium in Boise, Idaho and was the 12th edition of the Humanitarian Bowl. It was sponsored by the New Plymouth, Idaho-based company Roady's Truck Stops, which claims to be the largest chain of truck stops in the United States. The 2008 Nevada Wolf Pack football team represented the University of Nevada, Reno during the 2008 NCAA Division I FBS football season. Nevada competed as a member of the Western Athletic Conference (WAC). The 2006 MPC Computers Bowl was a postseason college football bowl game held on December 31, 2006 at Bronco Stadium in Boise, Idaho. The game featured tie-ins between the Atlantic Coast Conference (ACC), which was represented by the Miami Hurricanes, and the Western Athletic Conference (WAC), represented by the Nevada Wolf Pack. The game was sponsored by the MPC Corporation, which was formerly known as Micron. The 2010 Nevada Wolf Pack football team represented the University of Nevada, Reno in the 2010 NCAA Division I FBS football season. The Wolf Pack were led by head coach Chris Ault. They played their home games at Mackay Stadium and were members of the Western Athletic Conference. They finished the regular season 12–1, 7–1 in WAC play to share the conference championship with Boise State and Hawaii. They were invited to the Kraft Fight Hunger Bowl where they defeated Boston College 20–13 to finish the season with a 13–1 record. Jerry Scattini is an American former college football coach. He served as the head coach at the University of Nevada, Reno from 1969 to 1975. He amassed a 37–36–1 record during his tenure. Richard Matthew Trachok is an American former university athletic director and college football coach. He served as the head coach at the University of Nevada, Reno from 1959 to 1968. He amassed a 40–48–3 record during his tenure. Trachok served as the University of Nevada athletic director until 1986. The 2012 Nevada Wolf Pack football team represented the University of Nevada, Reno in the 2012 NCAA Division I FBS football season. The Wolf Pack were led by head coach Chris Ault in his 28th overall season and 9th straight since taking over as head coach for the third time in 2004. They played their home games at Mackay Stadium and were first year members of the Mountain West Conference. They finished the season 7–6, 4–4 in Mountain West play to finish in fifth place. They were invited to the New Mexico Bowl where they were defeated by Arizona. Willis "Coach I" Ireland was an American college football and baseball coach in Nevada. He was the first head coach of the UNLV Rebels football team, UNLV athletic director and founder of the Battle for the Fremont Cannon. Additionally, he was head baseball coach at the University of Nevada, Reno. ↑ "Nevada AD Ault succeeds Tormey". The Seattle Times . December 4, 2003. ↑ "Ault deserves credit for coaching accomplishments". The Nevada Sagebrush . September 25, 2007. Archived from the original on September 26, 2009. ↑ "Nevada coach Chris Ault retires]". ESPN . December 28, 2012. ↑ "Una leggenda alla guida dei Rhinos: Chris Ault!". Rhinos Milano. September 17, 2015.